I noticed late last week that a few daffodils had bloomed in front of the house. Not unusual most places, even up the hill from my house, but where I live they tend to be later. It’s especially strange since it hasn’t been very warm. I thought about cutting them and bringing them inside, but I liked the pop of color outside. Yesterday morning I woke up to find them buried in snow. This one is trying to come back now that it’s melted a bit. We only see snow on the ground a few times a year, so it was even weirder than the blooming daffodils. It made me REALLY wish I had cut the poor things. I decided to make some out of fabric for the indoors, sure to be safe from this crazy weather. I’m going to walk you through my three experiments, saving my favorite for last. I like all of them for different reasons, so I’ll let you choose for yourself. To make one of these, you’ll need five 4” squares and one 1 1/2 x 20” strip of fabric and a small circle of felt, about 1” across. For this first version, you’ll also need a 2” square of fabric. In the photo above, the first one is on the far right. Fold a square in half with wrong sides together. The fold is at the top. Fold one upper corner down to the center bottom. Fold the other upper corner down to the center to create a triangle. Pin in place. Repeat with the other four squares. Fold the long strip in half and lay on top of the triangle with the raw edges together. 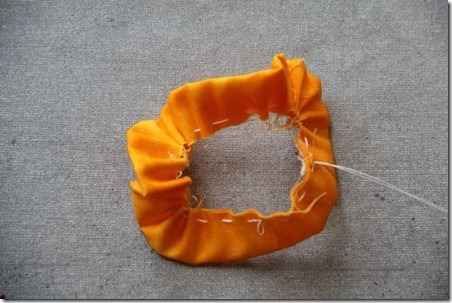 With knotted thread and needle, start on one end and take long stitches near the edge through all layers. 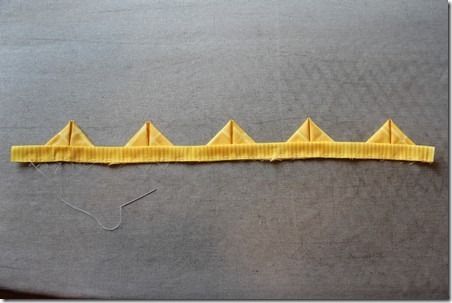 Add the next triangle and continue stitching, repeating until all triangles are attached to the strip. If the strip is longer than your triangles, cut off the excess. Gather tightly. Stitch ends together and knot thread. Holding the petals, pull up on the gathered strip in the center so it stands up from the flower. 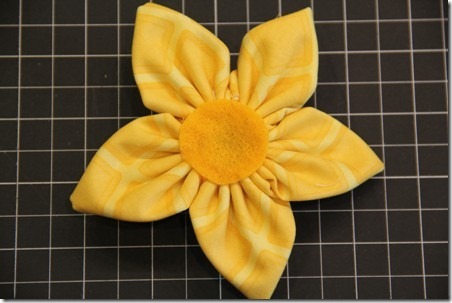 Turn the flower over and glue a felt circle on the bottom with hot glue. Stitch large stitches around the 2” square. Gather and knot. Glue into center of flower with the gathered side down. 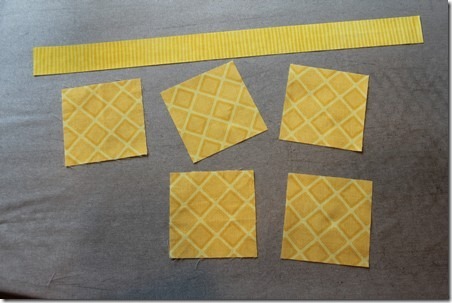 For the second version, far left in the photo above, you’ll need the same cuts of fabric, excluding the 2” square. Prepare the triangles the same way, but instead of sewing the triangles and strip together, just sew the triangles together by themselves. Stitch a long running stitch near the raw edge of the folded strip. Gather. Stitch the ends together. Stitch through some of the folds on the outside to keep them standing upright. 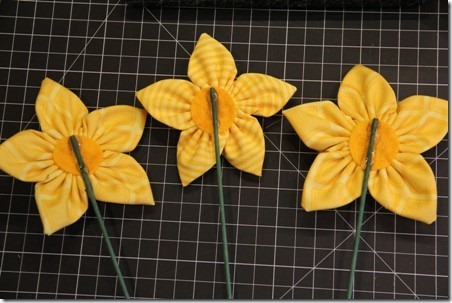 Prepare flower with the felt circle on the back, then sew or stitch the center to the flower. For the last, and my favorite, prepare the flower the same way as the second one above, including gluing the felt circle to the back. For the center, cut the strip down to 12”. Stitch the ends with right sides together. 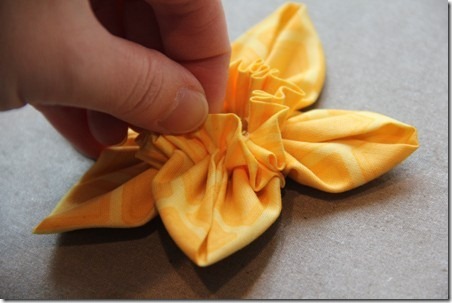 Fold in half with wrong sides together and stitch near edge. Pull the thread to gather. Knot thread. Glue into the center of the flower. You can glue a ribbon loop to the back to hang these. I knew I wanted to put them in a little vase, so I covered a wood skewer with floral tape and glued it to the back. It’s amazing how a few bright flowers can make March snow a little more bearable.